With so much experience under our belts, we know how to source what you want and how to get it to you quickly. We think about today, tomorrow, next week and next year. 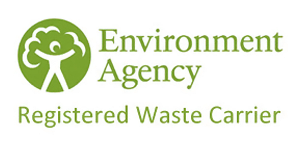 We love what we do and are constantly examining our processes to ensure the service we provide to you is second to none. We keep you informed throughout the cycle of your order. We are able to pinpoint when we will arrive at your home or business. You’ll know when the delivery will arrive allowing you to get on with special garden project or driveway that you had been planning. Trust us to deliver on time, every time. My family have been in the Haulage Industry for over 3 generations, providing a good reliable service for over 50 years. 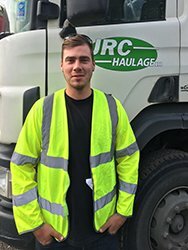 I began driving my own tipper truck in 2010 and started working with John from JRC Haulage in 2016. My passion in my spare time is following all kinds of motor sport. I started working in the Haulage Industry in 2010 book-keeping for our then new DLC Haulage company with my husband, Danny. We spent our holiday money on a new tipper truck!! In my spare-time I am a full-time mum. 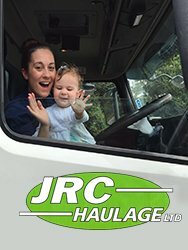 I began my journey with Haulage in 2016, following the family’s footsteps. Me and my brother have grown up around tippers and for as long as I can remember, driving my own lorry was what I aways wanted to do. 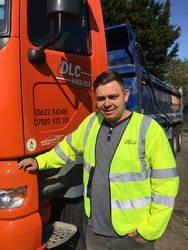 I’m happy to be part of my family’s legacy, driving alongside my brother from DLC Haulage since my company began. My passion is also motorsport and I enjoy dedicating any free time to car renovation projects. 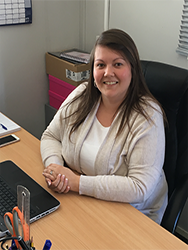 As the newest addition to the team, I have enjoyed book-keeping for JRC Haulage since 2016. I strive to support my partner John in growing our company, in the hope that it will provide for our kids’ futures. I am also a proud full-time mummy of two (boy and girl) and as you can see… one of them already wants to be like her daddy!